Today’s Guest post is by Kenneth Waldman. He is a Professional Writer and also an Editorial Assistant at EssayMama.com. The areas of his interest include the latest education trends and technologies, digital marketing, social media. Listening to radio stations is a terrific way to improve your ability to understand spoken English. Listening to the radio provides opportunities to listen to many different people speaking English at a normal rate of speed and in many different dialects and accents. Talk radio is especially helpful because it forces one to concentrate and focus on the spoken word. You will begin to listen and to understand English without translating from your mother tongue. You will improve your own accent and learn many commonly used phrases. Read about these 7 stations that can help you improve your spoken English, comprehension and vocabulary. 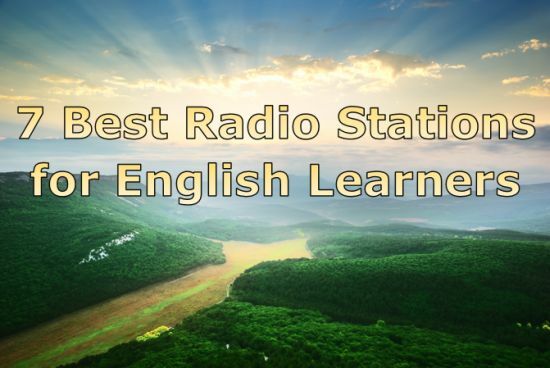 This radio station is specifically designed for those learning English. The speakers use simple English featuring a basic vocabulary and they read at a slower pace to help listeners focus and understand what is being said. The program is called “As It Is” and is 30 minutes long. Announcers use words and phrases especially written for people learning English. They also explain words and language rules while reporting stories and information from around the world. This is a national Australian site providing information about books and the arts. Topics cover performance, writing, visual arts, music and a wide variety of interviews, human interest stories and news from the world of the arts. Announcers speak at a normal pace. One of the nice things about this site is that you an also read a transcript while listening or download the program so you can listen to it at your own convenience. BBC radio provides many programs and covers just about every topic imaginable. They offer special programs for adults that include 6-minute grammar and the English We Speak. They even have special adult English broadcast and podcasts that cater to Russians and Chinese learning English. Podcasts include practical phrases and information about life in the UK. Canadian Broadcasting company provides a wide range of podcasts and radio shows for all tastes. Programs range from local news to personal stories, fashion, music and even comedy and the absurd. Although there are no podcasts specifically tailored for those learning English listening to any of the programs is certain to help one understand English better. Voice of America also offers an English course that is divided into 52 lessons that follow the lives of young Americans. The course includes weekly videos for listening practice, speaking practice and pronunciation. The neat thing about VOA’s English course is that it includes worksheets to practice writing, lesson plans and even an assessment. Along with the videos you can follow the written script while you listen. In addition to the learn English course one can listen to a wide variety of English language programs covering all types of news from local and international to arts and sports and more. You can listen to radio shows, download them, add them to a playlist and follow along with their program page. The RT site provides an all-English language channel that airs 24/7. This English language station is available to over 700 million viewers spread across the world. The broadcasts cover the most pressing domestic and international issues from a Russian perspective. New York Times Talk radio offers over 5,000 stations broadcasting in English. This site offers a more personal approach featuring discussions and interviews with many prominent people including politicians, media personalities and other public figures. The benefit of listening to NY talk radio is that the style of discussion is much freer and informal. It makes it easier for those learning English to follow along. This format also introduces more common English phrases and idioms that those learning English can use in their daily interactions. Listening to radio provides many benefits to those learning English. Many channels offer special English language courses as podcasts and tailor their content so it is easier for new English speakers to understand. Those new to English can hear different dialects and accents from English speakers around the world. Some channels provide listeners help to build vocabulary, and learn grammar. Many take time to explain the meaning of certain words and offer practice opportunities for speaking, listening and understanding as part of podcasts. Radio channels on the internet are free and they are a valuable language learning tool.